the White network - Tag Archive for "SS General Gutenberger"
• Training takes place at Castle Hulchrath, near the small Rhenish town of Erkelenz. The castle was at the time the HQ of the HSSPF-West, Karl Gutenberger. Here Prutzmann set up his Werwolf Staff HQ. Ilse Hirsch. 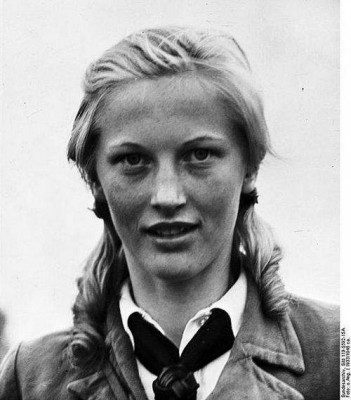 Ilse joined the Bund Deutscher Mädel also known as the BDM (League of German Girls) at the age of 16. In 1941 she became a full time BDM Organiser. In 1944 she volunteered for the 'Werewolves', she was then 23 years old . • ‘Operation Carnival’ begins when a captured B-17 bomber drops the group into a Belgian forest on March 20, 1945. • The trial of the ‘Werewolves’ takes place in October 1949 in Germany. All but one of their group is rounded up. Whiting, C (2002) Werewolf: The Nazi Resistance Movement 1944-1945, 3rd edition, London: Pan Macmillan. Longerich, P. 2012. [e-book] New York: Oxford University Press. pp. 715 – 716. Available through: Google Books http://preview.tinyurl.com/q4zyzm3 [Accessed: 11 Apr 2014]. Martinschiller.webs.com. 2014. Sisterhood of Suns – WW2: Nazi Germany. [online] Available at: http://martinschiller.webs.com/ww2-nazi-germany [Accessed: 12 Apr 2014]. Artileri.org. 2014. Inilah Wanita-wanita Yang Memiliki Pengaruh Pada Partai Nazi ~ ARTILERI. [online] Available at: http://www.artileri.org/2012/01/inilah-wanita-wanita-yang-memiliki.html [Accessed: 13 Apr 2014].